Have you heard there’s an election this Tuesday? Most likely, if you’re a regular reader of LA School Report, you certainly have, but it’s probably also likely that your friends and neighbors — or the parents you’re dropping off your kids with — have no idea there’s an election. Two school board districts face a runoff in this crucial election that could change the face of the board of the largest school district in the country that is elected (New York’s school board is appointed by the mayor). District 2’s incumbent Mónica García won her re-election outright in the March primary by getting more than 51 percent of the vote (she won 58 percent). The remaining four seats will extend to December 2020, so the next school board race won’t be until November 2020. Most of the ballots will have one or two items to vote on, and only two districts in the city will have a vote for school board candidates. District 4 encompasses portions of the cities of Beverly Hills, Inglewood, and West Hollywood, so some ballots will have just the school board race on it. All ballots in the city of Los Angeles will also include Amendment C, involving police disciplinary matters. None of the individual cities located in the school board districts have items to vote on this election. If you live in District 6 in the northeast San Fernando Valley, your ballot may include a Los Angeles City Council runoff of City Council District 7 (Sunland, Lake View Terrace, Pacoima, and Shadow Hills) where LAUSD board member Mónica Ratliff failed to make the cut in the primary. Those city elections will also include the Amendment C vote. District 6 also includes the separate incorporated city of San Fernando, but they have no local elections on the ballot in May. 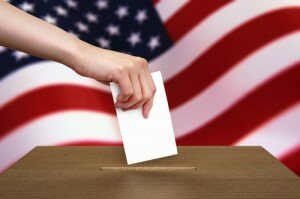 Despite the most money ever spent on a school board election in U.S. history, turnout is expected to be low, as it has historically been in school board races. Board Districts 4 and 6 are the two largest expanses of any of the seven school board districts. Also, the districts are much larger than any of the city council districts and include cities other than Los Angeles. Board District 4 extends from Pacific Palisades to Hollywood, from Topanga to Westchester. It includes parts of the San Fernando Valley such as Woodland Hills and Encino, as well as the Hollywood Hills, West Hollywood, Brentwood, and Hancock Park. The most northern school in the district is Stanley Mosk Elementary School in Winnetka, and the furthest south is Paseo del Rey Elementary Natural Science Magnet, while the westernmost school is Topanga Elementary Charter School and Bernstein High to the east. Board District 6 encompasses most of the northeast San Fernando Valley including the city of San Fernando and communities of North Hollywood, Van Nuys, Sun Valley, Pacoima, and Sunland. The most northern school is Sylmar Leadership Academy in Sylmar and the furthest south is East Valley High in North Hollywood. The westernmost school is Reseda High and to the east is Mountain View Elementary in Tujunga. These are the candidates, but you won’t see them on the same ballot. District 4 is a tight race between incumbent school board president Steve Zimmer and challenger Nick Melvoin. The position of school board president is voted on every year by the school board members themselves, and this is the second year that Zimmer’s colleagues picked him. A new president will be picked in June when the three newly elected board members are sworn in. Melvoin is a lawyer, former LA Unified teacher, and nonprofit education consultant. Read more about his answers involving the important issues of the campaign here. His campaign website is www.nickmelvoin.com. It is Zimmer’s final term; he would be termed out and could not run again after this election. Read his platforms of this campaign. So far, outside groups have spent the most on negative ads against him. His campaign website is stevezimmerforschoolboard.com. District 6 will have a new face no matter who gets in. Mónica Ratliff gave up her seat to run for Los Angeles City Council, but she didn’t make it to the runoff. 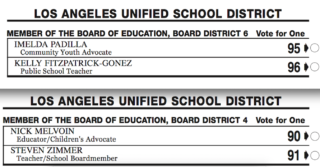 The candidates for school board are Kelly Gonez (kellygonez.com) and Imelda Padilla (imeldaforschoolboard.com). Find your polling place here, www.lavote.net/locator by putting in your last name, birth date, your address and ZIP code. It will give you your voting address, handicapped access information, and any special instructions (such as which door to go in, or which floor). Polling places will open Tuesday, May 16, at 7 a.m. and close at 8 p.m.
You can also see your sample ballot in a dozen different languages, including Tagalog, Hindi, Farsi, and Vietnamese. There’s also a link for a map to the polling location. *This article has been corrected: Nick Melvoin taught full-time in LAUSD.